Speedy and capacious, if a little costly on a pence per GB basis... and it's noisy! Seagate's latest addition to its Barracuda range isn't just another update using existing technology; it's a new desktop capacity record. At 750GB it offers amazing potential for everything from media centres to desktops. Once formatted, you're looking at 698GB of space, which is an incredible amount no matter how you look at it. This leap in capacity is possible thanks to perpendicular recording technology. Traditionally, drives lay the data bits parallel to the platter surface, but as these zones have become smaller, so their reliability has decreased. As the name suggests, perpendicular recording creates the state of each bit perpendicular to the media - improving stability and also enabling higher densities. 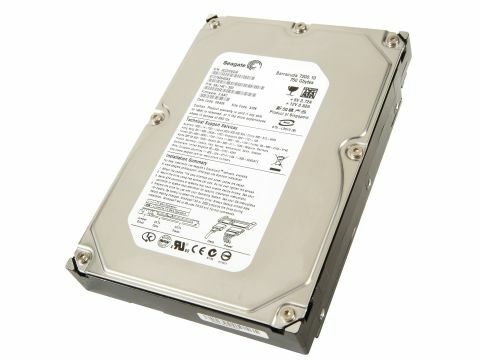 The drive is a 7,200RPM unit with a 16MB cache. In testing we witnessed a burst rate of 136MB/s in the standard SATA mode, boasting average read and write speeds of 62MB/s and 55MB/s, respectively - impressive. If you have a newer board that supports SATA 3Gbps, then you'll get an added performance boost from the drive once you've removed the jumper. This will force the unit in the faster transfer mode, resulting in a burst mode transfer rate of 254MB/s. The average read speed didn't alter on the faster interface, although the write speed did increase to 58MB/s. There are two downsides to this drive, however. The first is the price: at 36p per GB it may be in-line with the current 500GB drives, but it can't compete with the 320GB units that cost as little as 20p per GB. The second is the noise. Even when the drive isn't in use it sounds like a tickertape machine trilling away. This is a less than ideal solution for a living room or bedroom media centre PC - a shame considering its capacity. The fact that the drive is backed up by a five-year warranty is reassuring though, and it's an incredible amount of space for any drive to offer, especially one this fast. If you can justify the high initial outlay, and don't mind your drive clicking to itself, it really is an impressive leap forward.